It's been a while since I put the churn dashes up on the wall. The wall isn't big enough though, and I needed to know how many of each to make. So I sat down with some graph paper and colored pencils and started counting. I will need 400 blocks, so far I have about 150 completed. Now that I have a plan, I can keep going without having to do another big display. So my design wall today is more virtual than tangible, but extremely useful nonetheless. 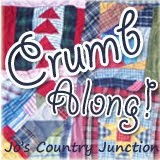 I am linking up with Judy at Patchwork Times, so be sure to go see what everyone else has up on their design walls today. I spent most of the morning helping Anna to finish painting her room. Now that it is reassembled, I will enjoy some sewing time this afternoon. 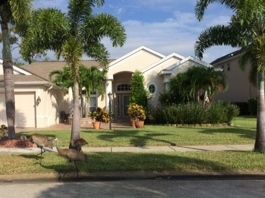 Our neighbors son is in town for a visit and he will be be bringing his family over for an afternoon swim, but other than that, it should be a pretty calm afternoon. 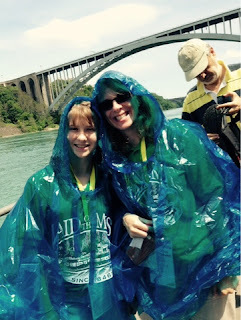 This might just be our only week of uninterrupted summer vacation and we are trying to enjoy every minute. I gave each of the kids a day and asked them to play something special they wanted to do. Ryan wants to go to Taco Bell for Dorito Loco Tacos on Tuesday. Sydney wants to stay up all night watching movies and eating popcorn on Wednesday. Anna wants to have a home version of cupcake wars with Sydney on Friday. That just leaves Thursday, I think I will take the gang out to see Jurassic World. Soaking up every minute of summer! Part of the quandary with long term scrap projects is figuring out when you are finished. I prepped another stack of orange peel blocks for applique last week. 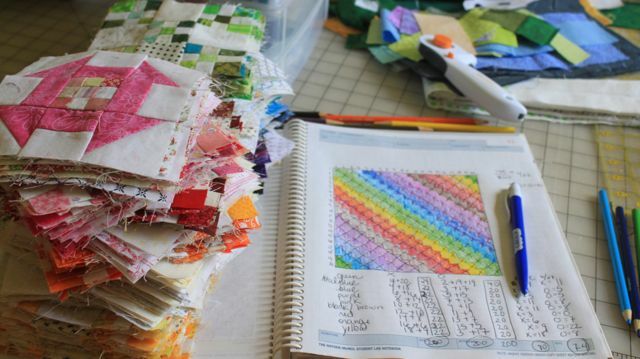 After getting caught in New York having sewn up all my prepped blocks, I wanted to make sure that the next trip has plenty of hand work ready to go. I think this stack should keep me busy for a while. I'll keep going on these until the end of the year. 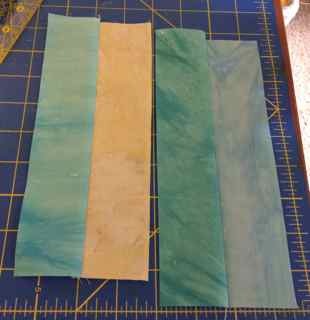 Most of the fabrics are hand dyes and batiks leftover from my Sawtooth Sampler and New York Beauty quilts, so these blocks need to keep going at least until those two projects are done. 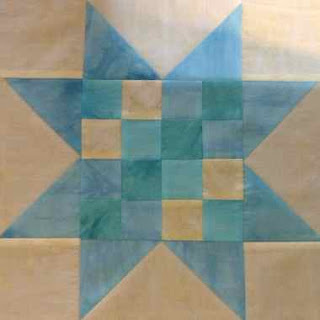 If you want to check out hand work, be sure to visit Kathy's Quilts for Slow Stitching Sunday. Then I spent some time organizing my OMG Churn Dash blocks. These little guys start with 1 inch strips that have been getting sewn in bits and pieces for several years now. I need to get out some graph paper and colored pencils to figure out how many of each color I will need. 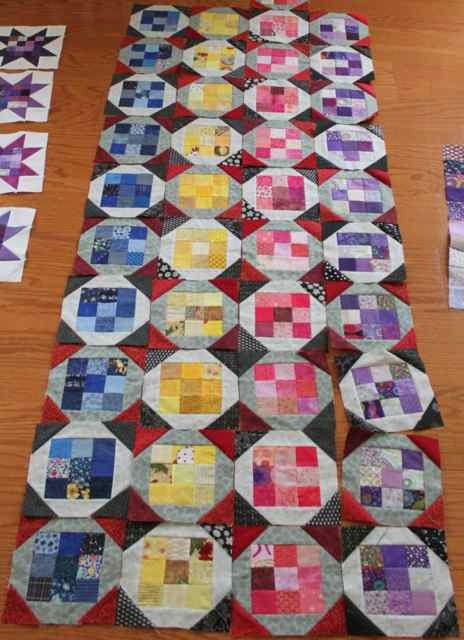 The plan is to have diagonal stripes of colors in rainbow order, but I'm not sure how many blocks or how big the quilt should be. I guess I'd better decide that so that I can figure out how many of what to get ready to go. It will still be a long term project, but it can't go on indefinitely. Can it? The color for July will be red. We've been working on cool colors for a few months now, so this will be quite a change. Hopefully your light blues are starting to dwindle. For me blue is one of those colors that just doesn't ever go away. The new month doesn't start until Wednesday, so I know that I will be using these last few days to finish up as much as I can. Use the linky below to let us know how you are doing with your light blues. 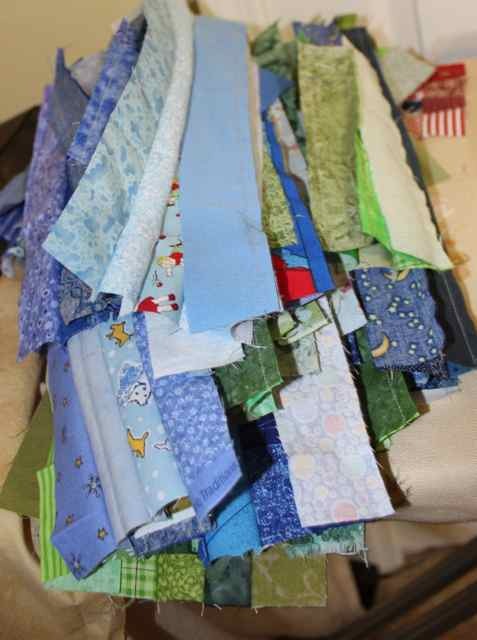 The shirts for Miranda's quilt are all stabilized and trimmed. It took about 8 hours for that part. Definitely the slow and tedious part of making t-shirt quilts. The bottom and top rows have large designs and shirts with the front and back combined. Both of those are trimmed to 18 inches in height. Then their are three smaller rows which are 8, 10 and 14 inches. I tried to cut the shirts as small as possible while still keeping all the designs. Now I'll need to get some color decisions and I'll be ready to sew the top together. The kids are all off at camp and Kurt has the day off. He got back from a trade show late last night after being diverted to another airport for weather delays. The kids were all happy that he brought back goodies. 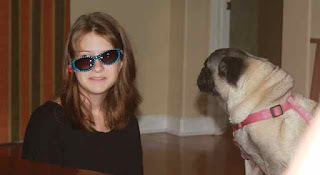 There were these sunglasses with flashing lights as well as some water bottles and t-shirts. I think we will go out to lunch together, what a treat. I'm still waiting for it to feel like summer. I am waiting anxiously for a few lazy home days to sew and putter around the house. I was at work three days this week doing organizing for the homeroom curriculum. They were only half days, but the girls are in camp this week, so by the time I dropped them off and went to school, there wasn't much time before going to get them again. Today was a home day though, so I started stabilizing the shirts for Miranda's T-Shirt Quilt. The blocks are about half done, but I'm out of stabilizer. I thought I had plenty, so I'm wondering if it is hiding somewhere? I'll have to go and dig a bit more after dinner. There is a lasagna in the oven that should be ready any minute now. 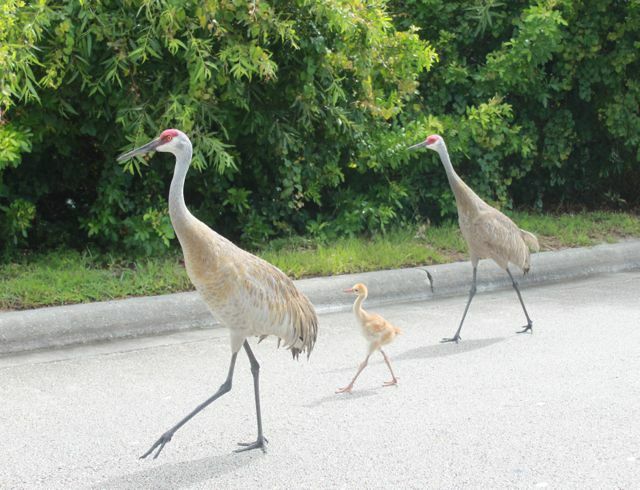 On the way home from the morning drop off today, I spotted this family of Sandhill Cranes. So sweet! Tomorrow is the last day of drama camp, so the evening will be the performance of Annie Junior. 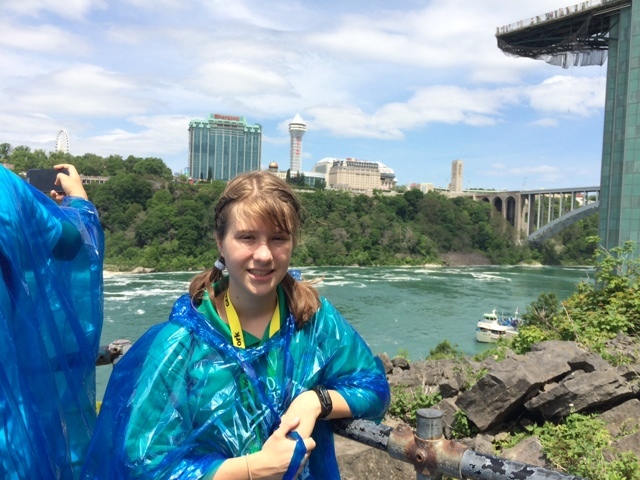 Sydney is one of the orphans, Anna has been volunteering as an assistant and Ryan will run a follow spot for the technical crew. The weekend looks wide open though. Anna has started painting her room, so finishing that up will be first on the list. Hopefully sewing will get to be second though. All the Orange Peel blocks that I sewed up at the begining of the year got sewed up during our trip to New York last week. First on my slow stitching agenda today is to prepare some more for the second half of the year. I wanted to lay all these out though to make sure I choose different fabric for the new blocks. 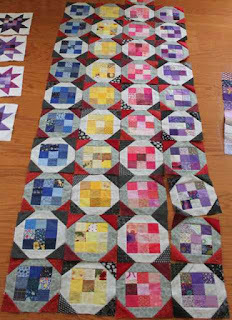 I am definitely going to sew each block together with 4 subunits in a circle formation of the same color. Almost definitely. 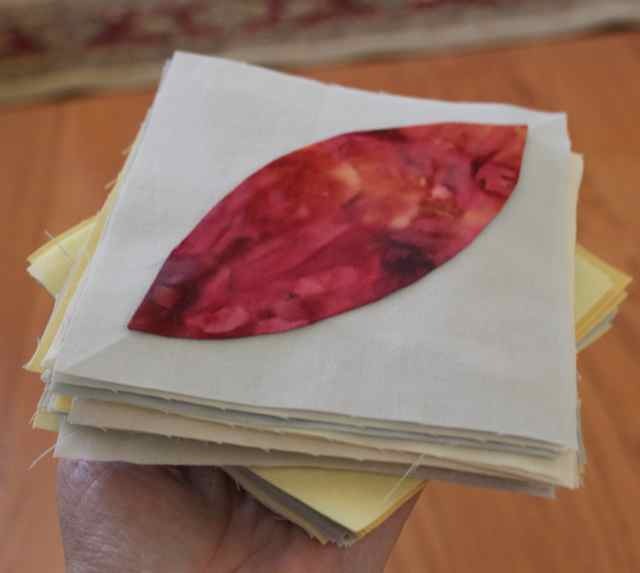 Somewhere I have a stack of freezer paper templates which are nicely reusable for ironing on to the chosen fabrics. Yesterday Anna came with me to a quilting day for Quilters Against Kids Hunger which is a local group making quilts to give to at-risk kids at local schools. Usually they have lots of kids who come to help out, but yesterday it was just the retired ladies and Anna and I. 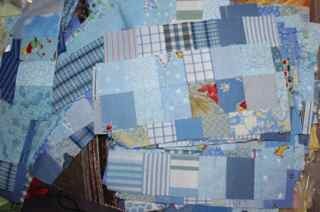 She had lot of fun though, sewing around the edges of layered quilts. I was on trimming and turning duty as we only brought one sewing machine. After the quilts got turned right side out again, Anna switched to sewing a faux binding around the edges. 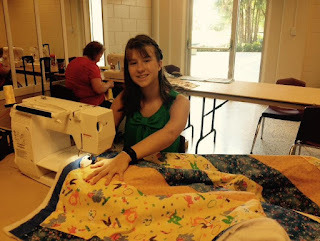 Though we only spent the morning, she sewed about 15 quilts, and admitted to enjoying herself while doing it! I hope you are all finding some time to slow down and enjoy some hand stitching today. Be sure to visit Kathy to see what others are stitching on this Father's Day Sunday. 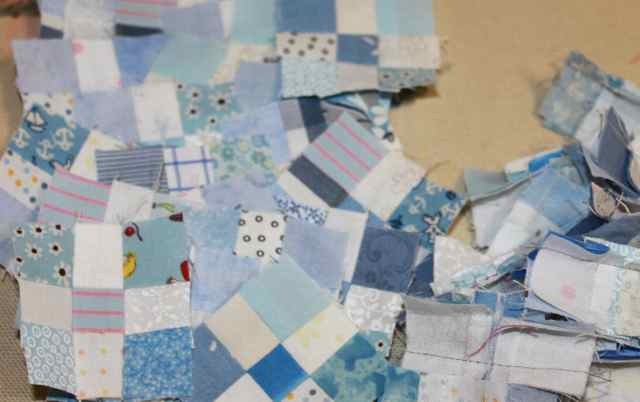 ScrapHappy Saturday - Light on Blues? ScrapHappy Saturday and I am finally home again! I just pulled out this stack of nine patches ready to be framed. They will be added in to this collection which is growing slowly month to month. What are you up to with your baby blues? You still have today to continue to work on your blues as well as next Saturday to wrap them all up. Use misterlinky below to share with us all. I am so darn happy to be back home again. 3:30 this morning came really early, but it was so worth it to be home again before lunch. 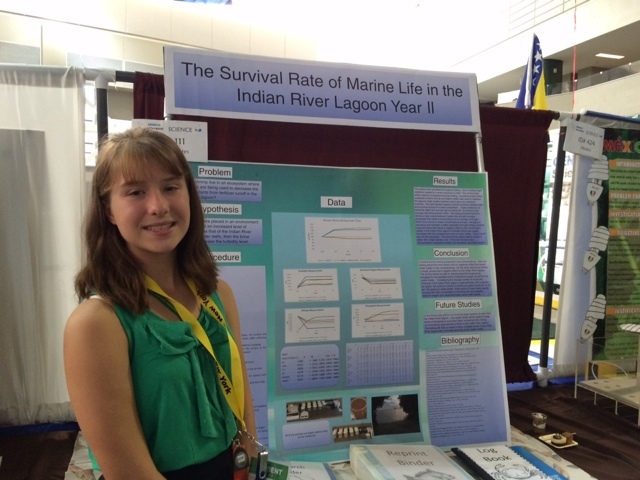 Anna earned an honorable mention for her project and was quite happy. 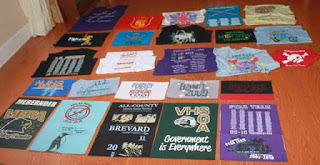 I spent some time before picking Sydney up at drama camp cutting out some shirts for another t-shirt quilt. Ironing comes next, but it is really hot out there. It seems wrong to add any heat to the house right now. First, maybe a short nap would be a good idea though. Did I mention that we were up at 3:30 this morning? In the morning! Yikes! 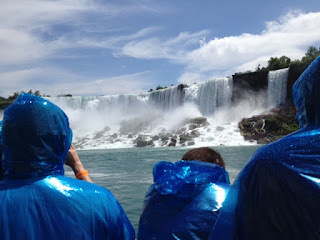 Yesterday was our bus tour to Niagara Falls. We took the Maid of the Mist boat tour to see the falls. Then we spent some time exploring and visited the aquarium. There was a stop at the second largest mall in the US on the way back to our dorm. Such a long day! Anna is off at a college fair now and there is an awards ceremony after lunch. I will be so happy to get home again tomorrow. Sleeping in my own bed again will be such a treat. 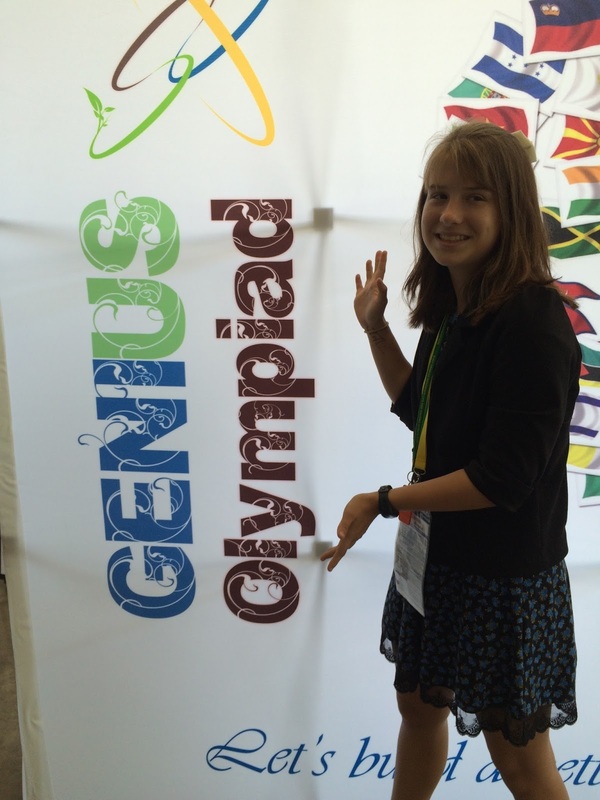 Anna hasn't needed me for much during the Genius Olympiad. She and her roomate Avery from Wisconsin are mostly hanging out together and randomly meeting up with other groups of kids. There was a college tour in the morning and then icebreaker games in the afternoon. Then last night was the opening ceremony. Judging was today, and that has just wrapped up. I really wish that I had brought more orange peels to appliqué. Everything that I brought along is done. Tomorrow is our trip to Niagra Falls though and I am very much looking forward to that. 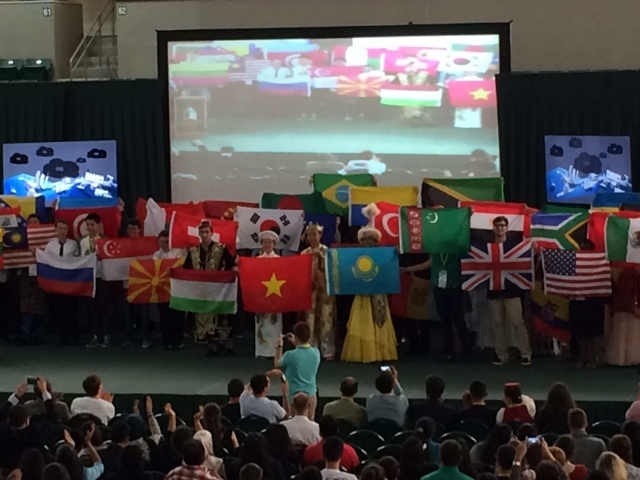 We have just arrived at Syracuse for the start of Genius Olympiad. On the two flights so far these 9 orange peel blocks were stitched. It will be two hours until the next shuttle to SUNY Oswego, so I will get a few mire done today for sure. So glad that these were all prepped and ready to go. Now I feel that I am being productive rather than just waiting. With the year approaching the halfway point, it is time to do some work on the alternate blocks. So far, most of the blocks are pretty scattered in the final layout, but some of the parts are starting to come together. So for the sake of organization, I thought I'd count everything up and post some total numbers for the sake of organization. I'd love to go ahead and start putting some blocks together, but with a flight first thing in the morning, I wanted to get at least this much done. In addition to the colored squares, you will also need background squares in 2.5 and 4.5 inch sizes. 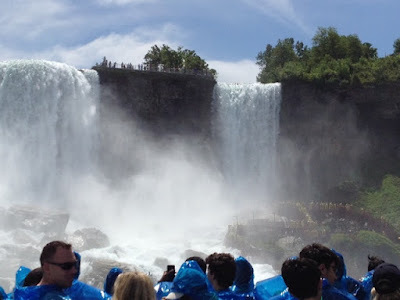 I'll post some pictures along with more specific instructions when I get back from New York, which I think is next weekend on Saturday. Until then, the links on the RSC15 Sampler tab are up to date, so you should be able to make sure you are all caught up as well. This is another of those great "leader and ender" blocks with a great secondary pattern. 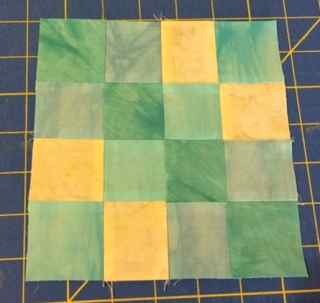 With a slightly different color placement it makes a fabulous x as an alternate block. I switched the colors though for the diagonal effect in a single block. You will need two four patches for this one. 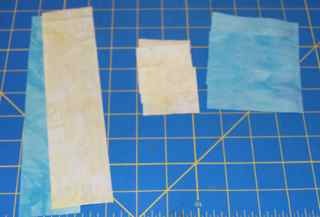 They come from 2 inch squares and can easily be pieced individually if you have lots of 2 inch squares handy, but as I was working with pieces of fabric, I just cut a 2 inch strip of blue and one of background fabric. Each of these strips will need to be at least 8 inches long. 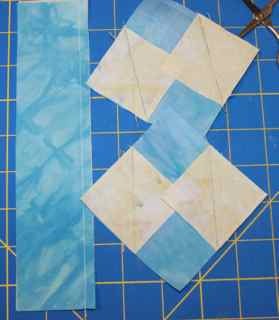 In addition, you will need 2 extra squares of background fabric that are the same size. Finally, cut 3.5 inch squares in blue. 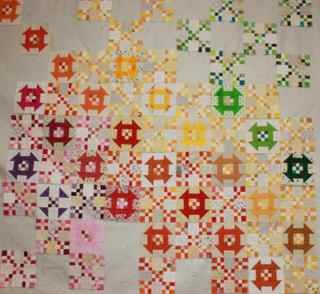 These are the squares that are traditionally done in background fabric. Feel free to mix up the color arrangement if you like. 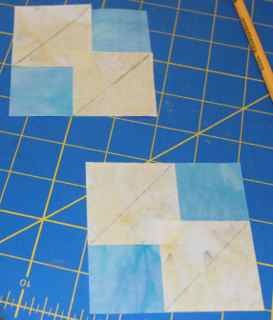 For the larger squares, you will use "flip-and-sew" corners. 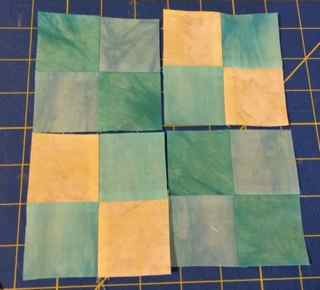 In order to make these, just place a two inch square in alternate corners of each 3.5 inch square and use a pencil to draw a diagonal line corner to corner. Sew on the drawn line. 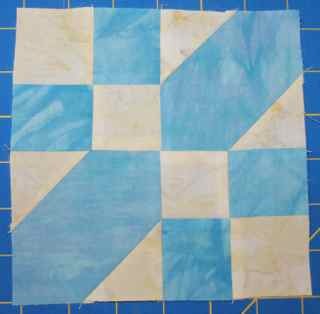 You may also sew a parallel line about 3/8 of an inch closer to the corner to yield bonus triangles. This part is optional of course. 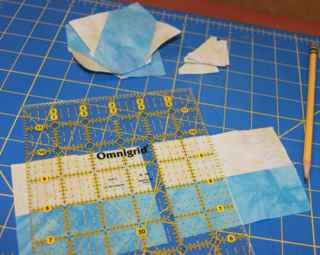 While sewing, go ahead and layer the two strips right sides together and sew those too. 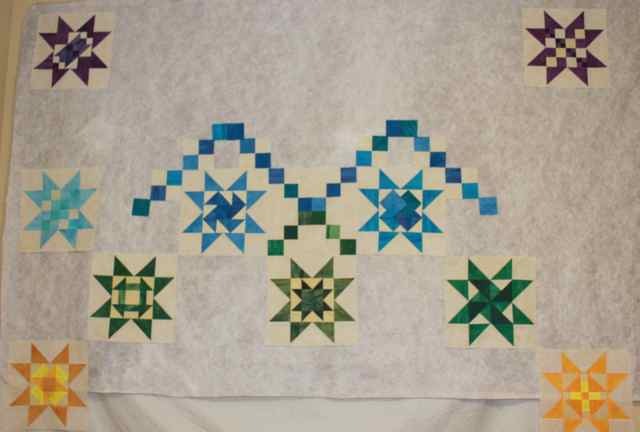 Press the strip set with the seam toward the dark fabric in the strip set and press the background triangles open on the large squares. Now onto the second phase of the cutting. Sub-cut the strip set into 2 inch segments. You will need 4 total units. Combine these into pairs and sew to make four patches. OK, now all your sub units are ready to go. Alternate them as shown, making sure that the blue squares form a nice diagonal running parallel to the seams of the alternate blocks. 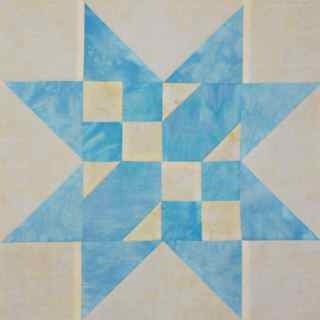 Sew your subunits together into a larger four patch which should measure 6.5 inches unfinished. Add the star points following the tutorial found on the RSC15 tab. Tada! Coming soon, I'll catch you all up on the alternate block directions. I've fallen a bit behind, but today is the day to play catch up again. 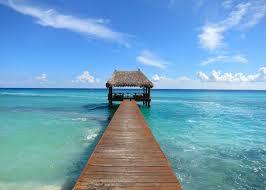 I'm home again after a fabulous trip to Cancun. 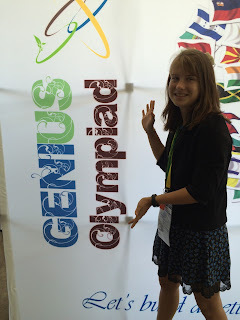 I'm off in the morning though to take Anna to Genius Olympiad in upstate New York. I'm looking forward to our outing to Niagara Falls. So I'll enjoy checking up on all of your baby blue blocks, even though I haven't made many of mine. 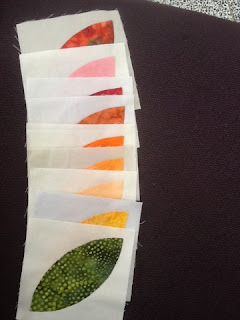 I did spend some time before vacation making more little nine patches out of these 1 inch strip sets. Here is a misterlinky for all of your updates. 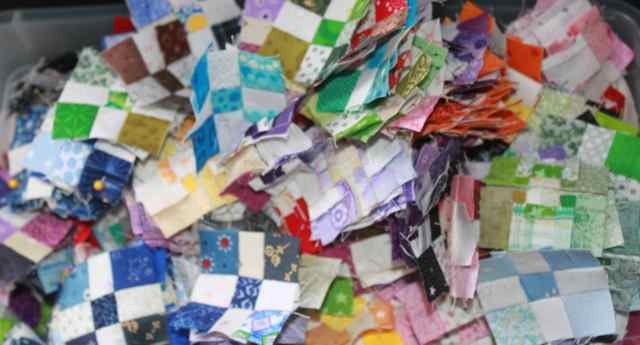 This is a nice simple block which would make a great scrap quilt with leaders and enders. 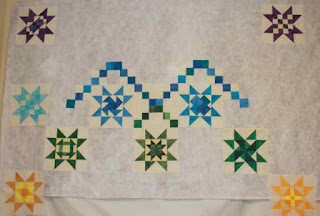 It started as a Garlic Knot block which was one of Bonnie Hunter's blocks from Addicted to Scraps. 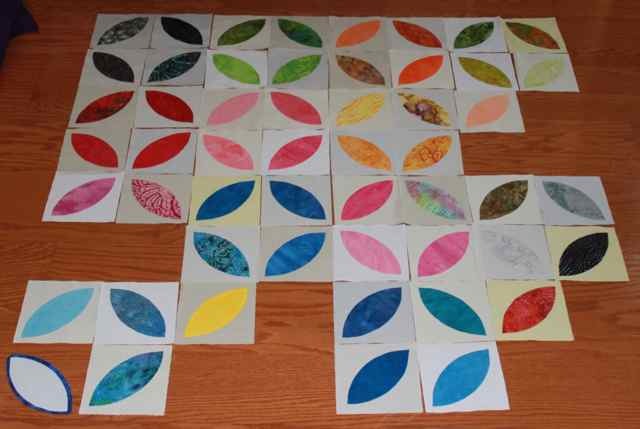 As I was planning the piecing though, I arranged the color placement to use equal numbers of each color subunit for ease of cutting. 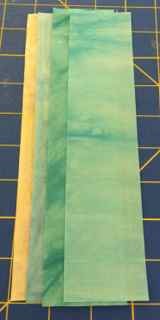 Start with four strips of fabric at least 8 inches long. I cut mine to about 8.5 inches to leave a little wiggle room for squaring up. 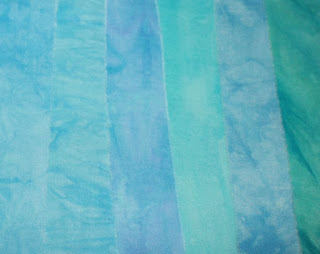 You will need three different shades of light blue along with one background fabric. 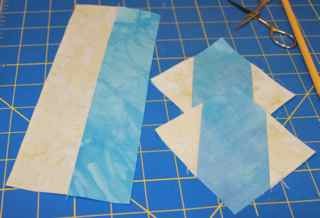 Sew the light and dark blue strips together, next sew the background and medium blue strips together. 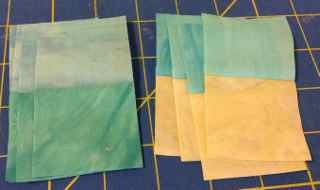 Press the seams toward the darker color for both strip sets. 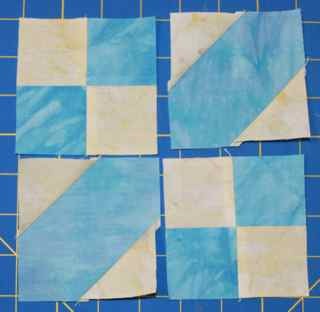 Sub-cut each strip set into four 2 inch pieces to yield 4 two patches of each color combination. 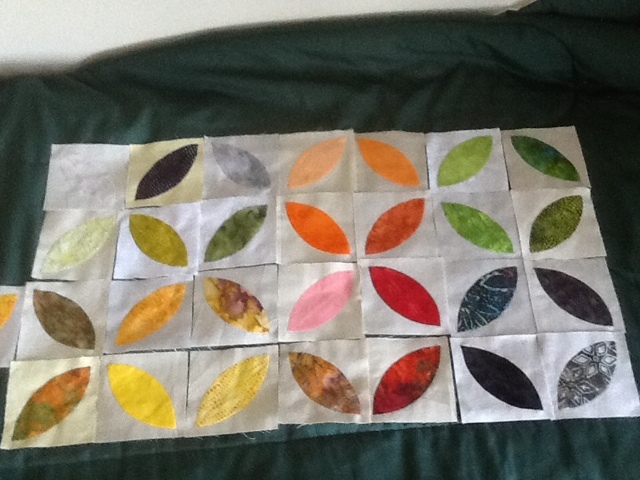 Combine matching colors and sew into 4 patch subunits. Carefully swirl your seams before pressing to reduce bulk and assure proper seam nestling in the next step. At this point you will have two four patches of each color combination. Arrange them so that the dark blue forms a diagonal from the upper left to the lower right while the light blue of the other color combination forms a diagonal line in the other direction. If you have pressed carefully, every single seam should alternate for a nice, flat block. 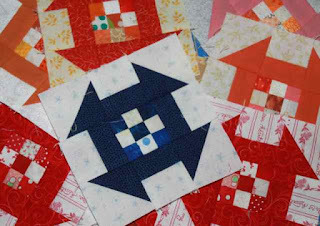 Sew the 4 four patches together into a single block and again, swirl the seams and press carefully. Finally, add your star points following the tutorial found on the RSC15 tab. Welcome to June! 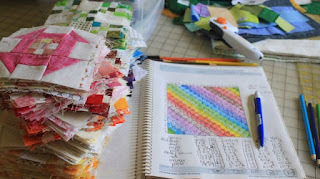 It is a new month at the Rainbow Scrap Challenge, and that means a new color and a fresh start. Put away the greens for now and switch gears to play with the lighter side of blue. For me this means baby blues, if you don't have enough for the month, feel free to play with the green blues, as they do not have a segregated month this year. Notice in the hand dyed inspiration fabric for June, that the aquas and light blues are all mixed in happily. Speaking of hand dyes. 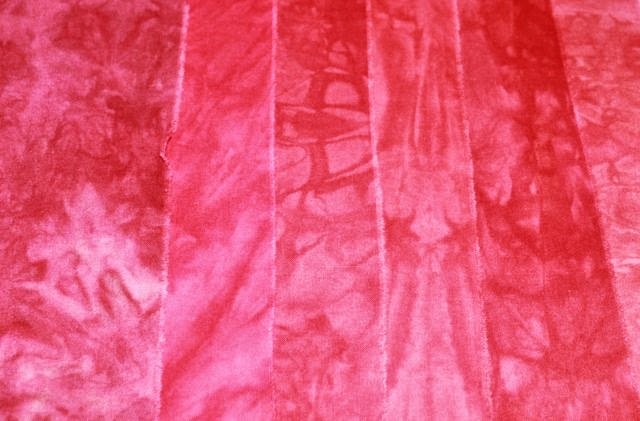 With a new month comes a new fabric giveaway. Ready to win this hand dyed fabric pack specially designed by Vicki Welsh over at Field Trips in Fiber? 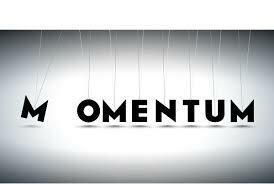 Just leave a comment on this post with the one project you would most like to finish this month. I will be drawing a winner as soon as I return from a short little vacation. I'll be enjoying my own shades of blue as found in the Caribbean sea for the next few days, but I'll draw a fabric winner as soon as I return. Good luck to you all. Yesterday was post planning, and so I went in to finish off grades and polish off the last of my checklist. When I got home, I started sewing tiny little nine patches. 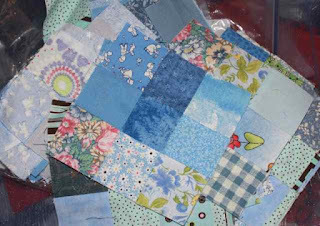 Now that I have a shoe box full of nine patches, I am ready to start turning them into bigger blocks. Most of them will go together with two inch squares to make slightly larger nine patches. The rest will be the center of these little churn dash blocks. I had a meeting with the Costa Rica Team first thing this morning. On the way home again I had to stop for this Sandhill Crane family walking down the street bobbing their little heads in unison. Now that I am home again, I think that I will cut out some more parts and make a few more blocks. Then I will clean the house a bit and do a bit of laundry. And so begin the lazy days of summer. Well, maybe not lazy, but definitely summer. It will be a short summer this year as they shift back to an earlier start date, and with several trips on the horizon, I plan to enjoy every minute of home time. Starting right now.